Corfton Road, Ealing. We designed and constructed a new extension to replace the existing conservatory to give our client a large modern kitchen dining room with easy access to the stunning rear garden. Walnut flooring and Kashmir White granite worktops with glossy cream units and folding sliding doors make this a wonderful space. 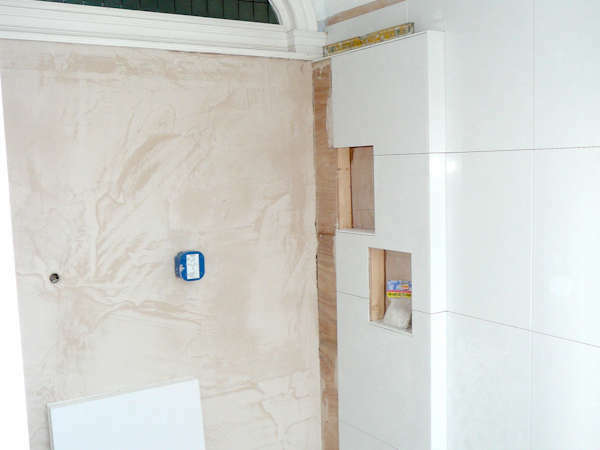 A luxury ensuite shower room with Italian mosaic tiles was created using a clever mix of designer and high street fittings. Double basins are very popular at the moment and there was a large range for our client to choose from. We love the finished effect and so did she.